A fun, interactive keepsake for the fan who knows the crack of a bat sounds different in every diamond. From Fenway to Dodgers Stadium, visiting every ballpark in America is a baseball lover's field of dreams. Commemorate the nostalgic pilgrimage with this screen print map. Do a seventh inning stretch at Camden Yards? Add a sticker in the Orioles team colors. Catch a foul ball at Wrigley Field? Add one for the Chicago Cubs. Whether it takes a summer or a lifetime to complete, it's a fun keepsake for the fan who knows the crack of a bat sounds different in every diamond. Map made by Seth and Maddy Lucas in Kansas City, Missouri. Stickers made in Colorado. Seth and Maddy Lucas run a design studio in Brooklyn, New York. Seth graduated with a degree in graphic design, and Maddy in photography, inspiring them to start an online wedding invitation shop during college. By the time they graduated, the store had grown into a full-time job and morphed into a shop for adventurers and lovers of all things campy and woodsy. Seth designs everything in the shop, Maddy runs the day-to-day business, and together they create unique products they’re both passionate about. Inspiration comes mostly from travel and summer road trips—their goal is to visit every National Park. Take a Studio Tour to see where Seth and Maddy's State Parks Maps come to life! Flatten for 24 hours before hanging, Stickers do not come off after placed on poster. I bought this as a gift for a friend that is a huge baseball fan. Bucket list to go to the stadiums. He loved it!!! I like the poster and it's a really neat idea, but I'm really disappointed that uncommon goods recommends a frame that doesn't actually fit. I bought the magnetic frame that the site recommends, but the poster print is too close to the edges to work with this frame! The poster is printed all the way to the very edge. I have just resigned myself to the fact that 2 of the stadiums in the list will be hidden by the frame. Definitely not worth the money for this reason. He enjoyed it but it is not a scratch off map, meaning you will have to keep track of the provided stickers for years. Nice but not what I wanted. My husband and I got married at Fenway Park--on the home team dugout to be specific. As life-long Red Sox fans, we could not think of a more magical place to get married. We have ever since talked about taking in a game together as every Major League Ballpark. While we have separately visited some, we want to visit them all together. I got this map as a Christmas present for my husband and we put our first sticker on the map--Fenway Park. Looking forward to adding more stickers over the years. I mean, it just is what it is; there's nothing all that special about it. I should not have paid the price I did. For that price, the hanging equipment should come with it. I got it for my boyfriend because it's his dream to have visited all MLB stadiums but, honestly, after seeing it in person I felt kind of silly about it. It would be better suited for a teen or college kid. The baseball fan in my life loved this product and it looks great on his wall. 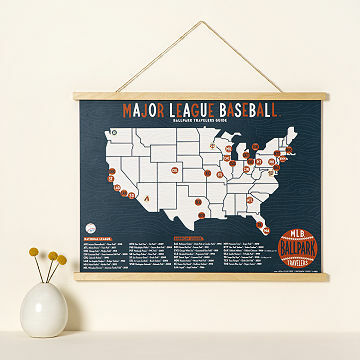 This gift was great for my fiance who loves baseball and has a goal to see every baseball stadium. The one disappointing factor was that the map does not come with the magnetic hanging frame as shown in the picture. My son has a goal of visiting all of the Major League Baseball stadiums. I've been searching for something he can keep track of his visits. The poster is perfect! I especially liked the stickers being the logos of the teams.